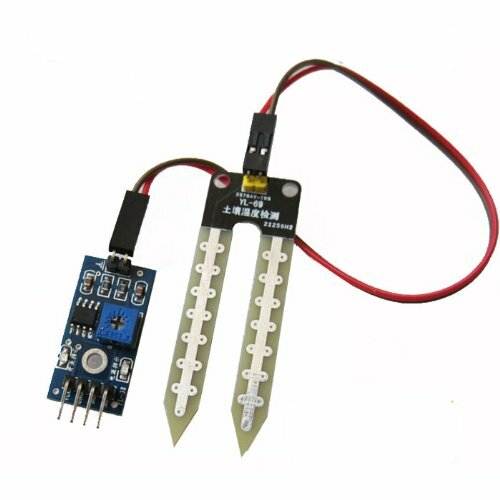 This soil moisture sensor is a simple breakout board for measuring the moisture in soil. Applications include automatic plant watering systems and more. This soil moisture sensor is a simple breakout board for measuring the moisture in soil. The digital mode which simply detects the presence of water and outputs a 1 and an analog mode which is more accurate. Applications of this sensor include Automatic watering systems and more. Connect VCC and GND pins to your Arduino or any microcontroller you are using and connect pin A0 to an analog pin of your microcontroller. One disadvantage of using this sensor is that it’s surface gets corroded easily so it is a good idea to put it in “sleep mode” in your code and power it only when you need to make a reading.